Author Sonia Grey's book delivers the potent message that love can move mountains… and deliver mankind from evil. Evil is created from the negative emotions of hatred, fear, and anger. Evil is a real energy that manifests, feeds, and sustains dark forces. In the fantasy novel "Message from Zanah", Satan’s rebirth is set in motion with the aid of the Devil’s advocates ,the evil Baron de Henchman and Lord Ainsbury, who bargain their souls to keep eternal youth. But then someone arrives to threaten everything. Sixteen-year-old Nicholai experiences another reality when he travels out of body to the astral plane. The vilest evil attacks him and takes everything from him of the life he knows. Then a beautiful girl helps him. Experiencing a mind-shattering pledge he made in another life, as well as a pact made three generations ago, Nicholai is drawn deeply into a paranormal world filled with danger and uncertainty. Needing unwavering faith to unlock the powers before him, he is armed with three mystical aids: The Empathic Sash, A Cloak to shield his aura, and The Sword of Truth. But he learns that the most powerful weapon of all is within himself because “love is the key.” As Lucifer’s ascension draws near, Nicholai must find the courage to face up to his destiny. The terrifying conflict ahead can not only save his true love, but the future of humankind as well. About the Author: Sonia Grey used her beliefs and experiences of the paranormal realms to create this story aimed at readers age 12 and older, and for those who like a spiritual or fantasy fiction read. “My stories always carry within them certain truths and a real message that Nicholai, the hero of this first of the trilogies, discovers.” Born in London, the author grew up and lived most of her life in Hastings. Now residing in Eastbourne with her husband and family, her interest in the paranormal began at an early age. She spent time with her father, George Gilbert Bonner, one of Britain’s top researchers in the field of EVP, Electronic Voice Phenomenon, compiling information for his book, but realized after her own paranormal experiences that she was compelled write her own. 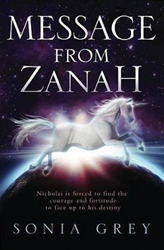 MESSAGE FROM ZANAH (ISBN: 978-1-49036-354-7) is now available for $14 and can be ordered through: Amazon.com or Barnesandnoble.com and other retailers.